Yamaha CX5M music computer "The world's first music computer now has a broader repertoire" two-page full colour advertisement from pages 84 and 85 in the April 1986 issue of Keyboard Magazine. 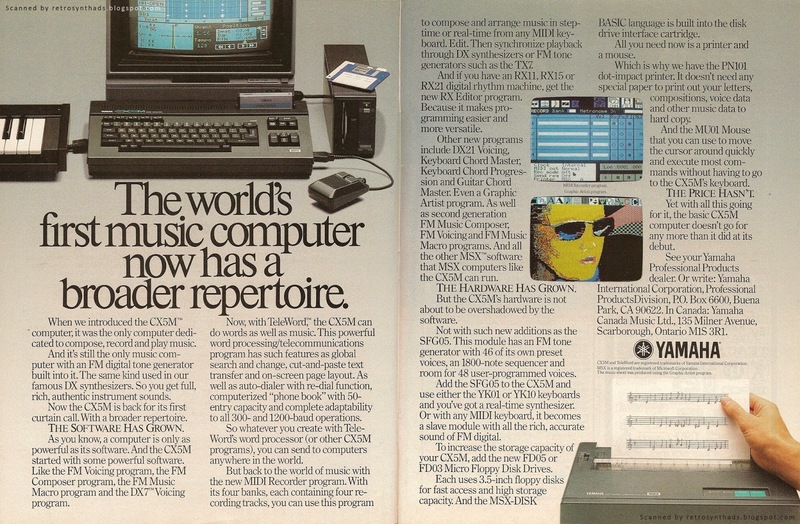 Over a year after CX5M's 1985 "You've always had an ear for music..." introductory advertisement started running, Yamaha finally came out with an encore in another two-pager. Show readers how much the music software and hardware had grown for the platform. Push the business side of the machine. Did you catch that in the middle of this list? They threw a graphics program in there! And they even thought it was such a great addition to the system that they let a screen shot take up some valuable real-estate in the ad. SFG05 - FM tone generator module with 46 of its own preset voices, an 1800-note sequencer and room for 48 user-programmed voices. FD05 and FD03 Micro Floppy 3.5" disk drives (with MSX-DISK BASIC language "built into the disk drive interface cartridge" - what ever that means?!?! Again - Yamaha has made an interesting choice to use up precious page real estate to include a photo of that Yamaha printer, and although that printer is printing out music notation, its clear that Yamaha is also positioning this thing as a business machine. If that big photo of the printer isn't enough evidence of the business side of things, you only have to look at that ad-copy. Before Yamaha even begins to give readers insight into the new MUSIC hardware and software available, Yamaha spends **two paragraph**s talking about TeleWord - CX5M's word processor. Teleword featured "advanced" (my air-quotes) word processing functionality such as global search and change, cut-and-paste text transfer and on-screen page layout. On the communications front, it included an auto-dialer with redial, 50-entry digital phone book and complete adaptability with 300 and 1200-baud operations. Remember - this was 1986. Telecommunications among pleebs like us was still occurring mostly through services like Compu$erve at dial-up speeds and huge connection costs. Still, I love this line from the ad. "So whatever you create with TeleWord's word process (or other CX5M programs), you can send to computers anywhere in the world." And I'm still waiting for a good one to pop up on eBay. Yamaha CX5M computer "You've always had an ear for music..." three page colour advertisement from pages 63, 64 and 65 in the February 1985 issue of Keyboard Magazine. This advertisement first ran in the February 1985 issue of Keyboard Magazine as a three-pager. 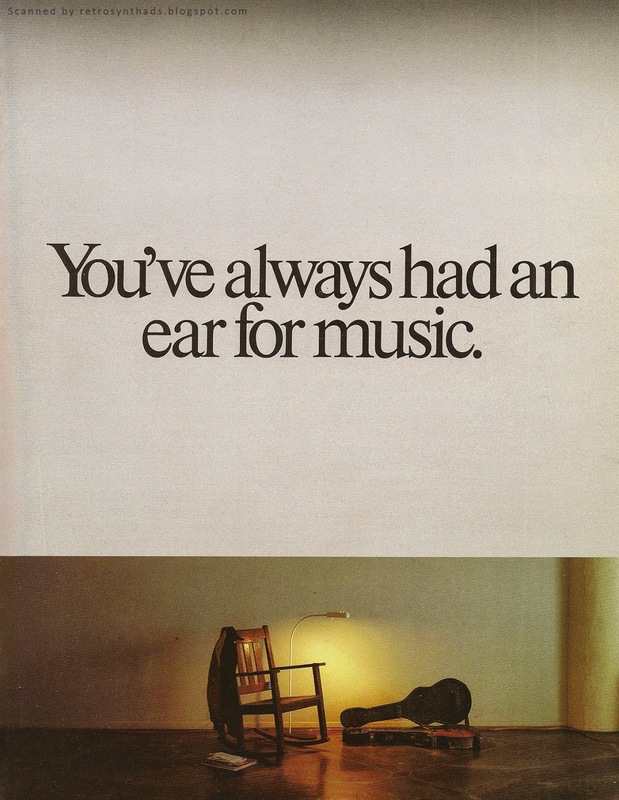 The teaser page - "You've always had an ear for music." - appears on the previous page and although there is absolutely no Yamaha logo to be found anywhere on that page, that large recognizable font has been around long enough in the company's ads that the whole page already oozes "Yamaha". The bottom photo found on that teaser page is a great one too - a dark room, an empty chair and an instrument known to require a fabulous ear (as well as extreme talent) to play. The best part of the photo is the lighting, and in particular that the darkness of the room is broken by two light sources. The first light source is a lamp that subtly directs the readers attention towards the right. And the second is the natural light seeping in from the right side of the page again drawing the readers' eyes in the direction of the next page. You have no choice but to flip the page. And that last piece of software is interesting because the ad doesn't actually say anything more about it, but actually uses it as a teaser by saying "More on this in another ad". The photo on this page is excellent too. It spans the bottom of both pages, and you can see how that natural light coming in from the right side of the page draws the eyes towards the small, well organized studio space and that nicely-coiffed gentleman. He kinda sits like I do at work all day. I wonder if he also has back problems?!? Anyways, after this February advertisement ran as a three-pager, it was merged down to two pages. But, in order to do so, the designer had to somehow squeeze that first part of the ad-title (the teaser text) above second part found on the second page - the "Now you have a mind for it". And the only way that was going to happen was by shrinking the text down a few point sizes. And that's exactly what the designer. This two page version ran in March and September 1985, as well as February and March 1986. This CX5M ad came out before the QX1 ad I blogged about previously started running, but there was some overlap between them near the end of 1985. And you can see the overlap it their designs too. The QX1 definitelly got its keyboard look from the CX5M. Both units resemble computers - eeeeer... actually, the CX5M *is* a computer. The ad states that it is an "MSX computer". Looking at the fine print and you will see that MSX was a Microsoft computer platform. I'd never heard of this operating system, but according to the MSX Wikipedia page, the American-based Microsoft first announced MSX in June 1983 as part of an attempt to standardize hardware between manufactures, but surprisingly MSX-based machines didn't really get popular in it's home country. Apparently due to a Commodore-led price war going on there. But, elsewhere the MSX hardware was the bees knees. Places like Japan, the Middle East, Brazil, the Soviet Union and Netherlands. Even more surprisingly, it was a popular choice as a video game platform. Check out this fact - the Metal Gear series was first written for MSX hardware. Bam! If you live in North America, it might have been hard to look back at this ad and think of Yamaha as a home computer manufacturer - but in fact they made a few different MSX models. 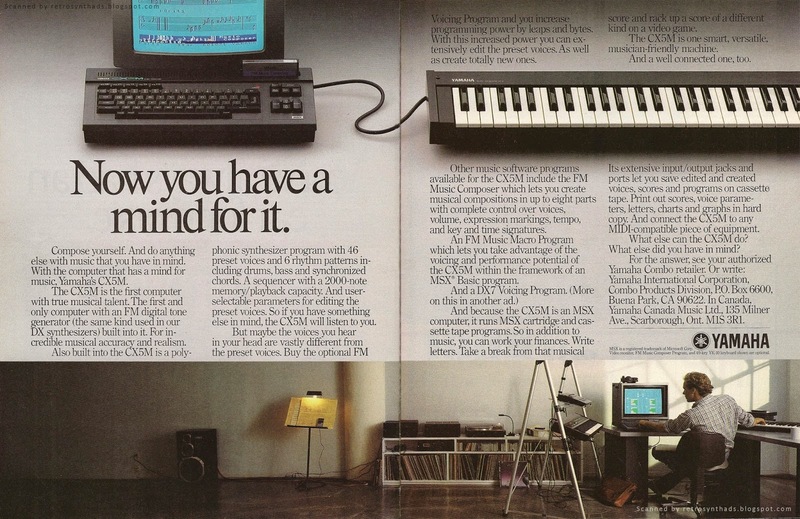 Some were marketed as personal computers like the YIS503II that could be found in Soviet schools, while others like the CX5M were marketed as machines strictly for making music (although even in this Yamaha CX5M ad they do mention near the end that you can also do your finances, write letters, and "rack up a score on a different type of video game". Get it... "score"... like music score... hee hee. Looking at that Wiki page, some of those MSX computers look really damn retro-cool. Yoiks - I'm getting that "collector" feeling in my loins. Yamaha Computer Assisted Music System (YCAMS) "This is the second most powerful tool for making music." 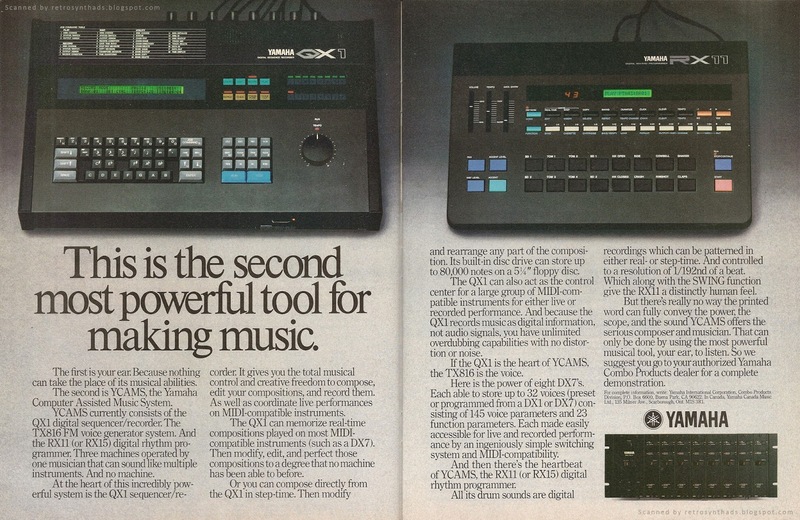 two-page colour advertisement including the QX1 digital sequencer/recorder, TX816 FM voice generator system and RX11 (or RX15) digital rhythm programmer from pages 48 and 49 in the July 1985 issue of Keyboard Magazine. Yamaha was advertising *a lot* in Keyboard magazine around this time period. It wouldn't be uncommon to see two or three pages worth of Yamaha ads in any given issue. This advertisement for the Yamaha Computer Assisted Music System began to appear around the summer of 1985, including the July, October and December issues. It also appeared in the January 1986 "MIDI Mania" issue on the back of the "MIDI sequencers: computer based and dedicated hardware" fold-out page. Nice placement! When this ad wasn't running, Yamaha's other two-page ad featuring it's CX5M computer and software system would make an appearance. To me, just the fact a company decides to go with a two-page ad says something about the product as much as the content of the ad itself. Its a signal by the company to the reader that they are investing heavily in whatever is being promoted. And the QX1 looked impressive enough to be worth a two-pager. No doubt! That's really all I can say about the QX1 though - that it looks impressive. Ever since I saw this ad years and years ago I have wanted one. But it was way out of my price range at the time (over $3000 in Canada), and I already had an Apple IIe, so replaced my first sequencer - the one on my Casio CZ5000 - with Master Tracks Pro software instead. But that QX1 with its awesome customized computer-like keyboard has never left my mind in the 30 years that have followed. And before I go further - YCAMS? There was no better, more memorable acronym? Okay - I can't think of anything better. YCAMS it is. Nevermind. Even as I type this, there is a QX1 sitting on eBay that I've been watching. But the only clue to its condition is that they've turned it on, and 'most times' it goes to Disk Imitation (whatever that is). So, I just watch it sit a zero bids. Do I chance it and bid? Gah. Ever since choosing Master Tracks Pro over the QX1, I've stuck with software sequencers for serious recording, picking up the odd hardware sequencer such as an MMT8, Roland MSQ100 and 700 only when opportunity, price and curiosity have intersected. Actually, my band mate and I took that MMT8 on stage a couple of times - never failed us. That track mute feature was awesome. Now that I've been persuaded to think about playing live again, the topic of a hardware sequencer has been stuck in my head. So, I started doing my research looking into a lot of old and new hardware sequencers including the Linn Electronics LinnSequencer that I blogged about last week, and the Yamaha QX1. And again, opportunity, price and curiosity collided to the extent that I fell into an Akai MPC2000XL, MPC1000 and 500 in rather short order. I think hardware sequencers are attractive to me because they are table-top oriented. The Yamaha QX1, Alesis MMT8, Roland MSQ700... all of them tabletop. It just makes sense. Similarly, as much as I like the space-savings provided by rack synths, I think tabletop synths like the Kawai K1m, Waldorf Microwave XT and Access Virus modules have equal charm for this reason. And I think that is why I am now gravitating towards the Akai MPC1000. Hardware. Tabletop. No computer required. And until Akai comes out with a new non-controller MPC, the 1000 seems to be the way to go. Plus you get some killer sampling to boot. But if I ever come across a QX1 guaranteed to work - well then... that MPC1000 may begin playing back-up duties.